A popular summer vegetable similar in appearance and taste to a cucumber, with a dark to light green mottled exterior and white delicately flavored flesh. Zucchini is a versatile vegetable that can be used in stir fries, soups, stews and goes well with a variety of other foods. Zucchini is a summer squash, and the blossoms can eaten, as well. The blossoms are often served stuffed and deep-fried. It´s a good source of folate, manganese and vitamin A. The zucchini is a small elongated summer squash. It can be yellow, green or light green in color and has a similar shape to a ridged cucumber. 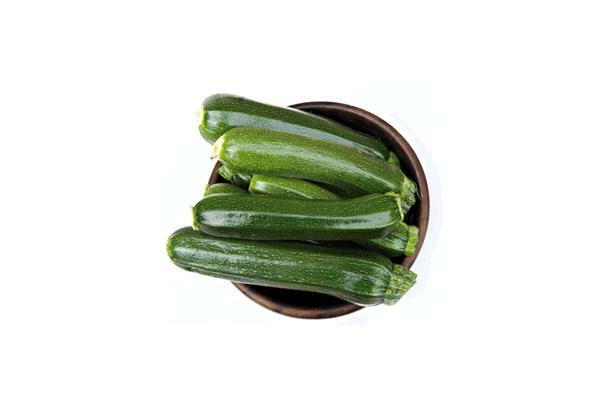 Choosing: Immature zucchini fruits are the best to select for the best taste. If you're using the zucchini in recipes or are planning to fry or bake them, it's best for them to be between 4 and 6 inches in length. If you're going to be stuffing your zucchini, opt for a slightly larger fruit of about 8 inches or so. The best zucchinis should be dark in color. Select those which are firm and heavy for their size in order to guarantee the best taste. As they grow, zucchini become softer and less tasty, so bigger is not always better when picking zucchini. Buying: You can buy Zucchini from your nearest grocery store. Procuring: Start thinking and planning out your garden layout in the winter months so when the threat of frost is gone come spring time, you are ready to plant you zucchini. Put one seed per small peat pots indoors one month before the freezing temperatures are gone. This will start your vines nicely and you can place the entire peat pot in ground without having to disturb the roots. Plant your zucchini seedlings or vines spaced apart in the ground just enough so they won't strangle each other when the vines and leaves start growing and with plenty of sunshine through out the day. Zucchini leaves are known to be very large and can overrun smaller plants if they are too close. If you are limited on space you can plant the vines near a fence or add a strong garden lattice and grow your zucchini vertically. Grow the Zucchini vertically if your garden is limited in space. You will need to place a strong lattice close to the zucchini so that you can secure the heavy vine to it. Water them deeply every few days you may need to adjust the vines if they are being grown vertically. Let the top of the soil dry before re-watering. Wash off any insects and mildew on the fruit of the plants as well as the leaves and vines. Keeping the whole plant healthy and free of bugs will insure good zucchini and a health garden. Be patient and wait for the zucchinis to start showing up. These plants like to grow plenty of leaves and male flowers before it rewards you with its squash. Harvest the zucchinis before they reach full maturity, when they are less than 8 inches long, tender and full of flavor. If they get bigger than this they become tasteless and dry. Zucchini can be sliced and eaten raw, shaved into thin slices and layered into lasagna, shredded, sauteed or food processed and baked in bread. Cleaning: Trim the ends and rinse lightly. Store zucchini for use in the near future without washing it first. The vegetable will spoil much faster if it is bruised or punctured, so the less handling, the better. Put whole zucchini in a plastic bag and place in a cool area of the kitchen. If the weather is very hot, keep the zucchini in the refrigerator for 4 to 7 days. In 2005, a poll of 2,000 people revealed the courgette to be the Britain's 10th favorite culinary vegetable. In Mexico, the flower (known as flor de calabaza) is preferred over the fruit and is often cooked in soups or used as a filling for quesadillas. History: In all probability, this occurred in the very late 19th century, probably near Milan; early varieties usually included the names of nearby cities in their names. The alternate name courgette is from the French word for the vegetable, with the same spelling, and is commonly used in France, Ireland, and the United Kingdom. It is a diminutive of courge, French for squash. "Zucca" is the Italian word for squash and "zucchina" is its diminutive, becoming "zucchine" in the plural. However, "zucchino", the masculine form, becoming "zucchini" in the plural, is just as commonly used and is prevalent in Tuscany. Italian dictionaries such as "lo Zingarelli 1995, Zanichelli editor", give both forms. "Zucchini" is used in Italy , and in Australia, Canada and the United States. 'Zucchini' is plural in Italian whereas in English it is singular. The first records of zucchini in the United States date to the early 1920s. It was almost certainly brought over by Italian immigrants and probably was first cultivated in the United States in California.